An innovative method for prolonging the freshness of fruit and vegetables, developed by Curtin University, has taken out top prize at the 2017 Mitsubishi Corporation WA Innovator of the Year awards. The awards, which are in their eleventh year, acknowledge and reward exceptional Western Australians who have developed an outstanding innovative product, technology or service. The innovation must be at the emerging or growth phase of development and demonstrate an economic, social or environmental benefit for the State. Semi-finalists and finalists in the awards program receive mentoring, presentation training, and advice on business development and finance to help commercialise their innovations. 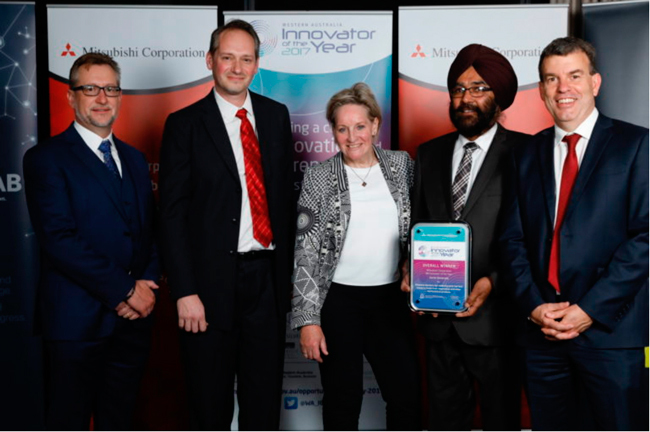 Curtin University won the overall Mitsubishi Corporation WA Innovator of the Year award for its ethylene blocking compounds that extend the storage, transport and shelf life of horticultural products. Winners from this year’s award category share in $145,000 prize money. For more information, visit http://www.jtsi.wa.gov.au/wa-ioty.